IK Multimedia, the leader in mobile music creation, is pleased to announce iRig® 2, the latest addition to its iRig range of products. The sequel to IK's groundbreaking and best-selling iRig guitar interface, iRig 2 builds on the design that made its predecessor so popular. It pairs great sound and streamlined convenience with new updated features like versatile input gain control, a ¼" amplifier output jack and Android compatibility. iRig 2 makes for a versatile tool that's perfect for practice sessions, live performances, jamming with friends, recording and more. The biggest update that iRig 2 brings is its new ¼" amplifier output. This augments its 1/8" headphone output by allowing musicians to use iRig 2 and their mobile device along with their favorite amplifier, without the use of an adaptor. This opens up a whole world of opportunities when paired with AmpliTube®, IK's powerful guitar and bass multi-effects processor. iRig 2 now lets musicians easily use AmpliTube's vast library of meticulously modelled virtual stompbox effects, amplifiers and other gear as a part of their physical rig. iRig 2's added switch allows dual-mode operation: FX lets musicians send a processed signal to their amplifier's ¼" output from apps like AmpliTube. THRU sends a clean signal, letting musicians use their mobile device as a tuner, recorder or other utility while using their classic analogue rig, which maintains the purity of a 100% analogue signal path. Made for both practice and performance, iRig 2 comes with a removable support that, together with a Velcro strip, allows easy mounting of iRig 2 on any mic or music stand, making iRig 2 perfectly at home on stage during live performance. iRig 2 has been made to be compatible with the widest range of instruments and mobile devices possible. Its built-in universal 1/8" TRRS output connector provides a true plug-and-play experience on iPhone, iPod touch, Mac and Android. Likewise, its 1/4" instrument input works with any guitar, bass or line-level instrument. 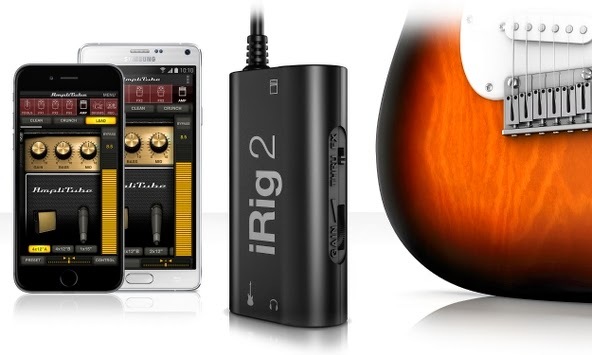 To ensure the best sound quality, iRig 2 comes with an input gain thumbwheel that allows musicians to dial in the perfect setting for their setup - iRig 2 works just as well when its connecting a wailing 3 humbucker electric guitar to a Samsung Galaxy Note 4 as it does a jazzy archtop or mellow electric piano to an iPhone 6.
iRig 2 is now widely compatible with Android smartphones and tablets. Its 1/8" output connector is compatible with many popular Android devices produced by manufacturers like Samsung, LG, Motorola, HTC and more - any device with an 1/8" input that supports the CTIA/AHJ wiring standard works with iRig 2. Additionally, users with Android devices that support Samsung Professional Audio can enjoy AmpliTube for Android, a special version of the popular multi-effects processor that brings a full spread of meticulously modelled virtual gear to the Android platform. iRig 2 is ready to go right out of the box. It comes with a powerful cross-platform suite of apps and software that includes free versions of AmpliTube for iOS, Android and Mac/PC. And while iRig 2 is the ideal companion to AmpliTube, it also works with any other recording, processing, tuning or music app. The new iRig 2 interface will be available in Q1 2015 via the IK Online Store and select music and consumer electronics retailers worldwide for $39.99/€29.99 (excl. taxes).